Until the early 1990s, Albania was a repressive Communist country. Its citizens were not allowed to travel outside of the country unless they were politicians, athletes or musicians. But when those countrymen returned, they had to give up their passports so they could not flee the country. “It was kind of a privilege to travel at that time,” said violinist Gert Kumi during a Tuesday afternoon interview. At one time, Kumi had a chance to escape Albania, but didn’t because his family was still there. Had he left, he said, his family would have ended up in prison. No foreigners visited Albania. “A lot of people didn’t have an idea of how bad it was,” Kumi said. Through 1991, he said, Albania had 46 years of Communism, under the most repressive regime. “I grew up in that environment,” Kumi said. Despite the history of his home country, Kumi worked to become an award-winning violinist who has played at Lincoln Center and Radio City Music Hall. He played in a series of concerts with Elton John, broadcasted on NBC and Bravo. He also now is the artist in residence, head of the string department and violin professor at Grace College, Winona Lake. Sunday, Kumi will be featured in The Second Sunday Series’ presentation of “Down the Rhine,” starting at 7:30 p.m. The performance will take place at Rodeheaver Auditorium. Doors open at 7 p.m., and admission is free. Kumi will perform “The Sonata No. 1, Opus 12” by Beethoven. Kumi also will be featured when The Symphony of the Lakes kicks off its concert season Oct. 19 at 7:30 p.m. Kumi will perform “The Bruch Violin Concerto, No. 1, Opus 26 in G Minor” by romantic German composer Max Bruch. The performance will take place at Rodeheaver Auditorium. Doors open at 7 p.m. and admission is free. Kumi was born in Tirana, Albania, in 1971. Both of his parents were teachers. His older sister now is the academic coordinator and teaches at The King’s College in New York City. Kumi first picked up the violin at age 8. His sister was studying the violin at the time. When she took a break from her studies, Kumi locked the door behind him and tried to play his sister’s violin. “I just made noise,” he said. His sister wasn’t happy that he was messing with her instrument. But his interest in his sister’s violin was a signal to his parents. Another signal to his parents that Kumi might be interested in music was his constant whistling, in tune. Two of his mom’s brothers were professional musicians, and they had Kumi tested. They found Kumi had the ear for music. He auditioned for a professional music school in Albania at only age 8 against 200 potential students. They only chose one – Kumi. For his auditions, he had to sing, whistle and call out pitches played to him. Until he finished high school, Kumi attended the music school. After graduation, he went to the Academy of Music in Tirana. 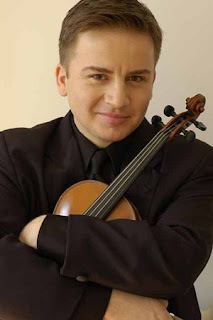 He received his bachelor’s degree, then worked five years with the Radio Symphony Orchestra of Albania. In conjunction with the orchestra, he also served as the concert master with the Young Virtuosi of Tirana. From 1985 to 2000, he toured all over Europe with the Young Virtuosi. Those 15 years were exciting, he said, and the group won many awards. He came to the United States in 2000 and auditioned for the Juilliard School of Music to earn his master’s degree in violin performance. He won the audition and was accepted as a scholarship student of Stephen Clapp, dean of Juilliard. He received his master’s degree in 2003. During his years at Juilliard, he had the opportunity to play at Carnegie Hall and Lincoln Center. He played at the time with the Bacchanalia Chamber Orchestra in New York City. In 2001, Clapp, who was involved with MasterWorks at the time, asked Kumi what he was doing that summer. Kumi wasn’t sure, so Clapp gave him a brochure on MasterWorks. Kumi was accepted, and he traveled to Houghton, N.Y.
“I liked it so much, I went back again in 2003,” Kumi said. After that, he was invited back to MasterWorks as a faculty member. He returned every year since. The MasterWorks Festival has been in Winona Lake since 2003. In 2006, Patrick Kavanaugh offered Kumi a place at Grace College. “So, here I am,” he said. The job offer was very good, he said. It gave him the opportunity not only to play music, but also to teach it. “That was one of the alluring parts of the job,” Kumi said. Another reason was the chance to work in a Christian environment like Grace College. “All these reasons made me accept this offer,” he said. He said he’s also very excited about the upcoming Second Series and Symphony of the Lakes concerts.